Tony Soos was a Hungarian refugee who spent a number of years as a prisoner at Dorchester Penitentiary in New Brunswick. 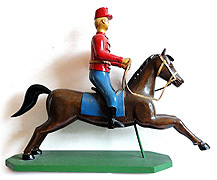 While he was in prison he created painted and unpainted wood carvings of soldiers, Hungarian mounted cavalry officiers and angels holding lamps. They were between 10" and 16" in height. He also made several six foot models of Hungarian galleons. His work rarely comes to market. Ref: Blake McKendry, An Illustrated Companion To Canadian Folk Art (1999); Kobayashi/Bird, A Compendium of Canadian Folk Artists (1985); Blake McKendry A Dictionary of Folk Artists in Canada from the 17th Century to the Present (1988).